In one of the most unbelievable swims I have ever witnessed Kara topped off a weekend of unthinkable performances with her national consideration and NESCAC Championship performance in the 200 breast. It was a senior swim of a lifetime - pure heart and determination... and a refusal to take the moment for granted. Hanson's 20 second drop in the 1650. Geiss's 100 free's (52.4 split!). Elle's 52.8 lead off. Skaperdas' lifetime best in the 200 fly. Lupi's two lifetime bests in the 200 back. It couldn't have been a better finale to fifth place finish that shocked me. Too much to write (I apologize for not writing down the everyone's name!! From the Maine Event to the Women's NESCAC meet, the great times never stopped - both in and out of the pool).... But now it is time to turn my focus to men and keep the ball the rolling. So proud to coach the TLC's! 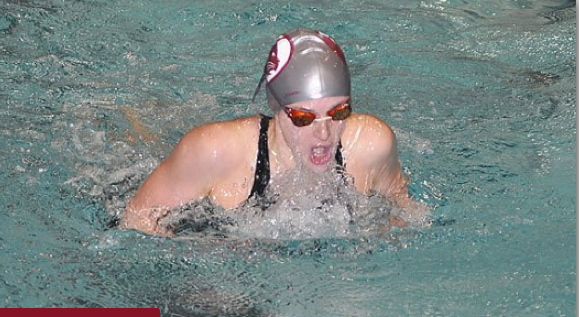 MIDDLETOWN, Conn. — Senior captain Kara Leasure became Bates’ first swimming event winner since 2005, breaking her own team record in the 200-yard breaststroke, to highlight the third and final day of the 2012 NESCAC Womens’ Swimming & Diving Championships at Wesleyan. The Bobcats finished fifth in the conference for the second straight year, and came out ahead of in season rivals Connecticut College and Bowdoin for the first time since 2003. Only 12-time repeating champion Williams (1,826), Tufts (1,430.5), Amherst (1,261.5) and Middlebury (1,125.5) outscored the Bobcats. Leasure (Los Alamos, N.M.) beat her own former team record of 2:21.6 in the 200 breast with a time of 2:21.11, her third national ‘B’ cut time of the meet (500 free, 400 IM, and 200 breast). Leasure beat out the runner-up, Amherst first-year Courtney Flynn, by 0.19 seconds. She is the team’s first event winner at NESCACs since Kelsey Lamdin’09 swept the diving crowns in 2009, and the first swimmer to win an event since Vanessa Williamson’05 in 2005. Sophomores Emilie Geissinger (Bismarck, N.D.) and Elle Sergi made a statement both going lifetime bests in the 100 free. Geiss made the A Final in the 100 free based on her prelim time of 53.26; she finished eighth in 53.38 in the final, for 22 team points for the Bobcats. Senior Jessica Howard (Cumberland, Maine) placed ninth in the preliminaries of the 3-meter diving event with 355.50 points, her second ninth-place outing of the meet. First-year Megan Lapp(Wellesley, Mass.) placed 13th with 297.55 points. The Bobcats finished the meet with a seventh-place performance in the 400 freestyle relay. Sophomore Gabrielle Sergi(Newburyport, Mass. ), sophomore Emily Depew (Hudson, Ohio), Leasure and Geissinger checked in at 3:33.73 to edge Connecticut College for seventh place. First-year Sarah Bouchard (Annapolis, Md.) finished 12th in the 1,650-yard freestyle in a tie of 17:43.14, less than two seconds from the team record set byTara Dugan ’13 (Wilton, Conn.) last year. Awesome swimming!!! I watched from the live feed last night- what a swim Kara! KARA, I LOVE YOU. I cannot describe how exciting it was to watch you swim! Coach, you must put that video up so everyone can see it. I was cheering, screaming, jumping up and down and crying all at the same time. Congrats to the 2012 Bates Bobcats on an AMAZING season!